Caracol, Belize — Eight cyclists scrambled up the moonlit stone steps of Caana, Caracol’s tallest temple, to assemble under its curved ceiling of night sky, contemplate its 1,300-year-old ghosts, and practise the Downward Facing Dog. Yellow, our group’s bike mechanic, sits a few steps above us with four headlamps strapped to his head. He illuminates Taj’s movements as she patiently guides our wisecracking group from one yoga pose to another. At the beginning of the eighth century, about 150,000 people, 30,000 structures and 88 square kilometres of bustling Mayan civilization would have surrounded us. Now, only howler monkeys and the dark, tropical jungle of Belize bear witness to our awkward attempts to raise our tail bones. It’s taken five days and almost 500 kilometres of pedalling to get to this remote mountain plateau and we’re goofy and giddy, but not untouched by the sacredness of this place. The ghosts will make sure of that. “Did any of you sleep up there?” asks a groundskeeper the next morning, sternly motioning up at the pyramid’s site. This is a touchy topic for Michael de Jong, the Toronto-based organizer of this Temple To Temple bike event. He negotiated for six months with the archeology department of Belize’s National Institute of Culture and History to gain permission for our group of 30 cyclists and support staff to camp here. Everyone cracks up, though Anthony looks as if he’s not sure if this joke might apply to his bike or his body. This January was the first of what de Jong hopes will be an annual 750-kilometre tour of Belize. The entrepreneur, adventurer and founder of the 100-day Tour d’Afrique, a bike trip from Cairo to Cape Town, created the temple event to be both a competitive adventure race and a fully supported tour. The task of shepherding our assortment of professional racers, triathletes-in-training, two-wheeled travellers and bike commuters has kept him hopping. “I liked the idea of bringing different kinds of cyclists together,” de Jong said before the race. He also wanted them to explore Belize’s Route of the Mayas. True to its name, the race started at the Acropolis-like Lubaantun temple in the country’s south, then headed northwest to Caracol in the Mayan Mountains. Rather than have his racers take a direct route on two-lane asphalt, de Jong had devised a mixed-surface course that sent riders zigzagging across this small (280 kilometres long and 100 kilometres wide) Central American country on dirt, gravel and paved roads. Our seven-day Belize sampler would take us through Mayan villages, banana and orange groves, jaguar reserves and pine forests during the day; and into jungle campgrounds, river lodges, beachfront hotels and archeological sites overnight. Like Caracol, the Lubaantun site stands empty now, but ethnic Mayans still live and farm in the rolling hills that surround it. A quiet network of red-dirt rural roads not only offers cyclists access to hidden communities such as San Pedro Columbia, Conejo and Blue Creek (where we camped for the first night), but allows villagers to bus into coastal towns to sell their hand-crafted baskets, jewellery and needlework. Belize’s shoreline also attracts its share of international visitors. Towns such as Placencia and Hopkins offer relaxed all-inclusive and backpacker-style amenities and act as a departure point for snorkellers, divers, kite-surfers and fishers. They use the hundreds of nearby palm-treed islets to access the Western Hemisphere’s longest barrier reef. that heading away from the Caribbean did not lead us away from water. Flat, unpaved and free of traffic except for the occasional tractor hauling oranges and field workers, the 60-kilometre Coastal Road weaves northwest through hectares of citrus groves, savannah and forest reserves before the land rises into steep karst hillocks. It’s this limestone that eventually merges with the foothills of the Mayan Mountains and hides an extensive network of caverns and sinkholes. Turquoise and glossy, tributaries of the Siburn River tumble out of the rock and into the heart of the jungle throughout the area. At the Jaguar Paw Jungle Resort, it rewarded racers with a shady swimming hole. By the time the race was half over, “racers” had come to mean the peloton of athletes who had clearly joined the tour to train or compete. Roger Troyer of Belize demonstrated local knowledge and kept ahead of U.S. mountain-bike champion Walker Ferguson and other North American and British contenders. In the women’s group, German marathoner Kirsten Roesel maintained a consistent lead over Belize’s Shalini Zabaneh and Nevada’s Stephanie Vogel. The rest of us became the “tourers.” Given the choice of a full day climbing the jagged Mountain Pine Ridge road that led to Caracol or a half day cruising pavement, lunching at waterfalls, and chatting with Belizeans, we chose the latter. We lost our chance to win the race prize of a Gary Fisher X-Caliber bike, but we gained our bus driver’s valuable perspectives on which roadside plants make an effective nausea tonic, how to open beer bottles with your teeth, and why San Ignacio loves bicycles. 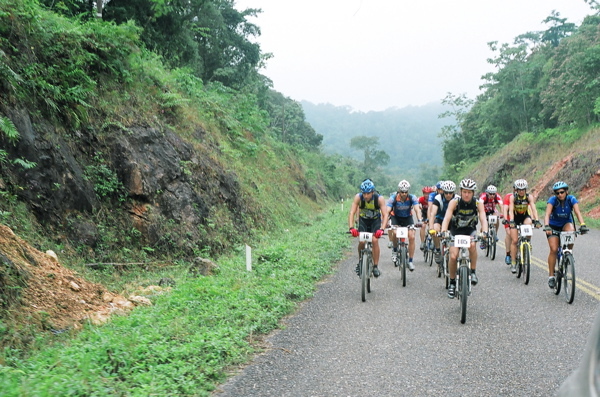 The tradition of bike racing in Belize dates back to a time when bicycles outnumbered automobiles. In 1928, 30 men mounted one-speed bicycles to persuade the government that it was possible to travel overland via a rutted track between the pirate-settled harbour of Belize City and Cayo (now San Ignacio) near the Guatemalan border. They completed the 230-kilometre return trip in four days. Today, that track is the country’s Western Highway and both men and women retrace the route in the annual Holy Saturday Cycling Cross Country Classic. The annual Easter weekend event marked its 77th consecutive year in 2005 and the winner completed it in just under six hours. Our course out of San Ignacio didn’t include the entire distance eastward into Belize City, but we did follow the road as far as the Hummingbird Highway turnoff. It turns out that de Jong is also a bit of a hotelier and, in grand style, he concluded the endurance race not at an isolated temple, but at the hibiscus-lined entranceway of the Placencia Hotel. As each sweaty, dirt-faced rider arrived, they were gently separated from their bikes and guided to elegant, tile-floored suites with floor-length robes and thick cotton towels. When they re-emerged, carpaccio pizzas and frosty Belikin beers greeted them at the hotel’s Azure Pool café. The meeting of gritty cyclists and opulent resort appeared incongruous at first, but for de Jong — who shares ownership of the newly opened hotel with Italian couple Marco Caruso and Michela Bardini — it all made perfect sense. Marco apologetically interrupted us for a moment and engaged de Jong in a discussion on the logistics of flying in a baby grand piano by helicopter for the upcoming music festival. De Jong seems to delight in cannonballing himself into elaborate endeavours. I suspect an airborne piano won’t pose much of a challenge. Published in the February 25, 2006 Travel section of Canada’s Globe and Mail. View photos.